Huge Savings Item! Save 18% on the Language Fundamentals, Grade 2 by EVAN-MOOR at Translate This Website. MPN: EDREMC2282. Hurry! Limited time offer. Offer valid only while supplies last. This comprehensive teaching resource helps second grade students master the conventions of standard English and boosts their vocabulary acquisition. This comprehensive teaching resource helps second grade students master the conventions of standard English and boosts their vocabulary acquisition. Easy-to-scaffold lessons are clearly organized by language skills and standards to help teachers target instruction. 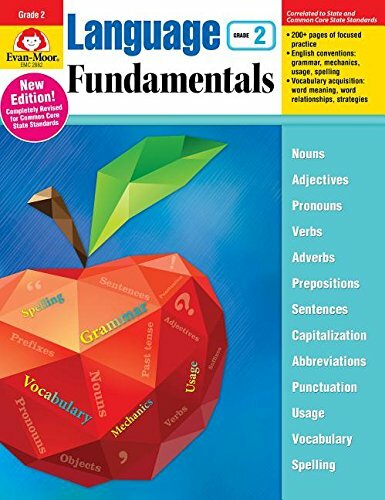 Language Fundamentals has 207 pages of skill-based activities, including 21 review pages with multiple choice, constructed response, and open-ended questions to assess students understanding and application of the focus skill. Format: The teachers edition includes reproducible student pages, teacher support pages, and an answer key. Second grade skill practice covers: Nouns, Pronouns, Adjectives, Verbs, Adverbs, Prepositions, Sentences, Capitalization, Abbreviations, Punctuation, Usage, Vocabulary, Spelling. This new edition features: Rules and examples for each language skill followed by targeted application activities and unit reviews. Vocabulary and word study strategies and practice for challenging skills such as shades of meaning and real-life connections between words and their use. Common Core Language Standards cited on activity pages for easy reference. Review activities that ask students to apply skills in context and demonstrate higher-level thinking. An easy-to-read answer key. View More In Schools & Teaching. If you have any questions about this product by EVAN-MOOR, contact us by completing and submitting the form below. If you are looking for a specif part number, please include it with your message. By Turnbull, Khara L. Pence/ Justice, Laura M.